"Are you a feminist?" This was the question whispered to director Jennifer Lee that inspired her to make "Feminist: Stories from Women's Liberation." Realizing that she couldn't give a quick answer that identified events during the feminist revolution that might have helped her explain why she was a feminist, Lee embarked on a feminist journey with a movie camera nine years ago.This one hour film looks at the women's liberation movement from 1963 through 1970. 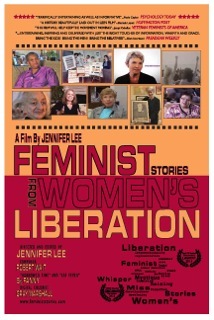 Interviewed in the film are over 20 feminists who discuss some of the main events of the feminist revolution. Some of the feminists in the film are well-known such as, Gloria Steinem and Betty Friedan. Others aren't as well-known such as, Aileen Hernandez, Heather Booth, Mary King, Sonia Pressman Fuentes, Frances M. Beal, and Betita Martinez. The film covers many events including the influence of Friedan's book, "The Feminine Mystique," the Civil Rights Movement, the Miss America Pageant protest, and more. The film includes songs from Fanny, the all-female rock band from the 1960s. Members of Fanny reunited for Lee to record songs for the film.